Mr Benn catapulted editor, director and producer Clive Juster into a lasting career in children’s media, first through the joint launch of independent production house King Rollo Films and then via intellectual property rights. 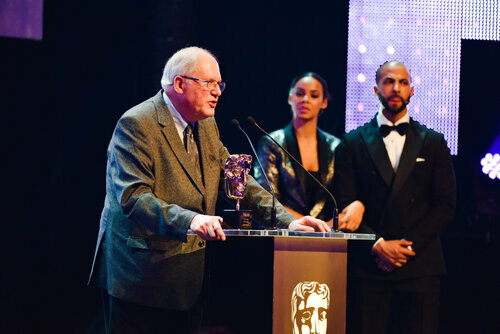 At the Children’s Awards in 2018, Juster was the recipient of the Special Award, one of BAFTA’s highest honours. Words by Rich Matthews. Never underestimate the power of three and a half hours of children’s television. That’s all that was made of iconic BBC series Mr Benn, yet the character has shaped childhood imaginations for nearly 50 years (first broadcast in 1971). Along with creator/artist David McKee, Mr Benn launched editor, director and producer Clive Juster into a lifelong career that saw him become part of the vanguard for a growing aspect of children’s entertainment – licensing of intellectual property. In 1978, Juster, McKee, and Leo Nielsen set up King Rollo Films, marking the beginning of one of the UK’s first independent children’s animation production houses. It would produce such shows as King Rollo, Towser, Spot the Dog, Maisy and Paz. Maisy would win the company a BAFTA for Children’s Pre-School Animation in 2000, topping 1999’s nomination for Spot in the Children’s Animation category. Paz, meanwhile, would earn the production team two Emmy nominations for Outstanding Children’s Pre-School Series in 2006 and 2007. Read the original feature in the Children’s Awards brochure here.